We have a new litter of purebred German Shepard puppies. They were born 3/18/17. All puppies will come with registration application from CKC and hall all their first round of shots. We currently have 7 puppies available for rehoming. Loc We are asking a $200 non refundable deposit to hold any available puppy. If something happens to the puppy before delivery that is out of our control your deposit will be refunded. If a deposit is places and you are no longer able to take the puppy we will NOT refund the deposit. All puppies will come with a health guarantee for atleast 6 months unless otherwise decided between us. All puppies will also come with a detailed pet contract we will ask you to sign before we release the puppy to your forever home. Contract will state health guarantee and other issue’s such as if you are unable to care for the dog at any point in time. We take full responsibility for our puppies as long as they are alive. Our goal is to find these puppies a home they will forver be loved and cared for. Please due your research on the breed before acquiring about the puppies, we will make sure you know what you are getting into with this breed of dog. We hold the right to denie any puppy applications which we will present to you when acquiring for a puppy. German shepards are great dogs, but are high energy and need a lot of room and attention. Again please due your research. 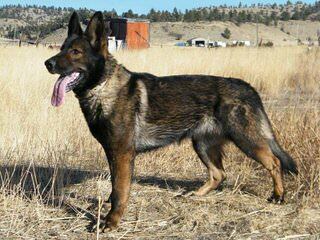 We breed for size in our German Shepards so these will be large to extra large sized dogs. Our female is of German blood lines but is still larger then the normal german shepard that you would see. She is sable. Our male is of Americam blood lines is shaped like the old German Shepards used to be before they were bred down to have the slop in the hind legs. He is red and black. He also has very piercing hazel eyes. Please feel free to contact me with any questions in regards to adoption or the dogs. They may be large and high energy but they will protect you with their life.